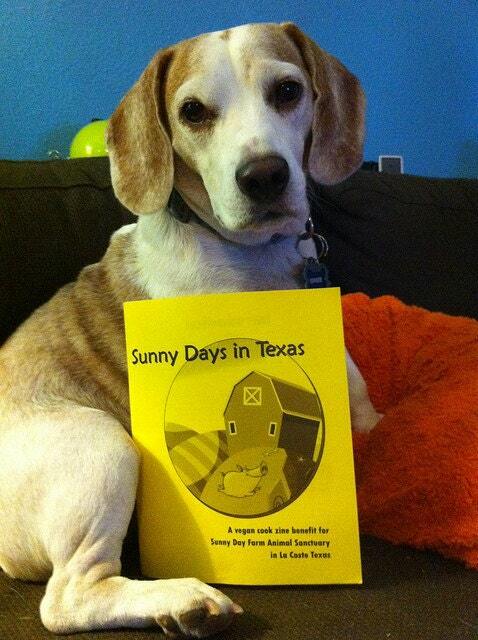 Sunny Days in Texas, the vegan cookzine for charity, is now available! NOTE 7/27/2018 Sunny Day Farms sadly closed down a while after this fundraiser. The zine is only available through Magcloud now and any money donated there goes to SARA animal sanctuary Texas. This past summer in Texas has been brutal. We had the most 100 degree days in a row ever, the worst drought ever, and a few weeks ago much of our beautiful central Texas Hill Country was engulfed in flames. The community here in Austin has done truly amazing work. Following Austin Pets Alive’s attempts to save all pets from Bastrop filled my heart with love for people again and on Saturday October 1st, we held a mega city wide bakesale that raised almost 13,000 dollars for relief efforts. The people, for the most part, will survive and hopefully rebuild but for the animals the fires and the drought have been completely devastating. The strangest part for me as a city dweller is that all the bugs are dead and critters have eaten my remaing cacti and succulents which are certainly not their typical food. I learned that in Texas you have to water your trees…. and your house or the foundation will crack. At Sunny Day Farms Animal Sanctuary in La Coste the cost of taking care of all the animals, without access to grazing grass and water, has risen dramatically. Poor Brooke, who runs the farm, told me that her days are spent at the river collecting water with 5 gallon water totes. As you can imagine, watering three hundred animals everyday has definitely proved to be a challenge. 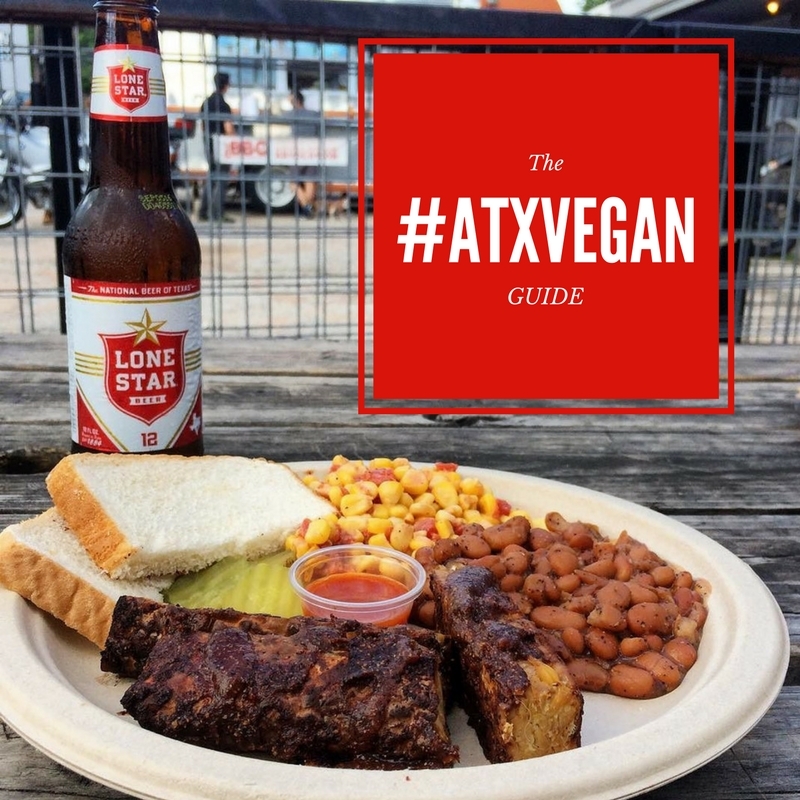 The vegan community in Austin has been doing what we can to help and I have been working on putting together an awesome recipe zine to raise money. 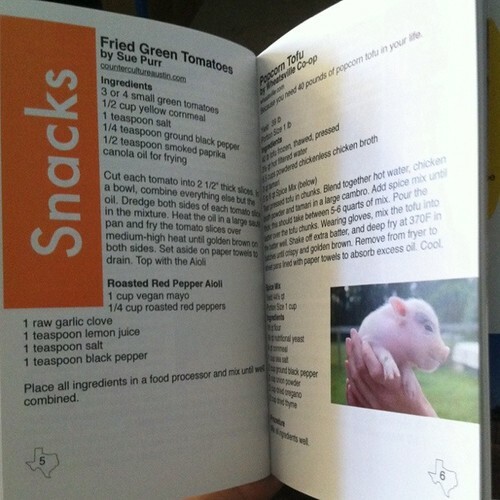 Many of Texas’ best writers and restaurants have donated Texas themed recipes to the effort and I have put together three different versions online for sale, though if you live in Austin you can pick a copy up at MonkeyWrench books and in Portland at Herbivore and Food Fight! 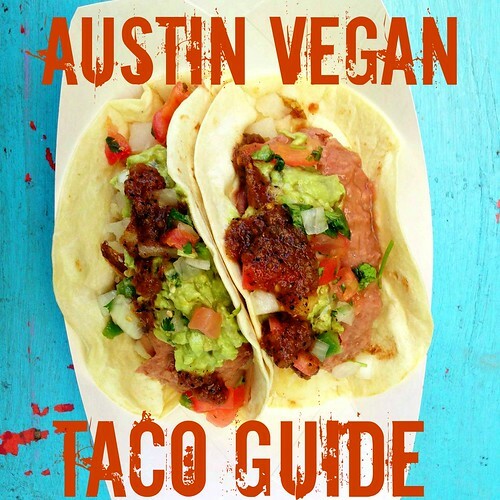 The zine has been a labor of love for sure, it is packed with fabulous recipes for everything from Ranch Dressing to Mexican Hot Dogs to Cowboy Cookies to Raw Tacos to Jackfruit Brisket. There are healthy recipes like Tex Mex stuffed peppers and Blackened Ceaser Tempeh wraps and then there are recipes for 40 pounds of battered and deep fried popcorn tofu, Oatmeal cream pies and homeade Oreos. 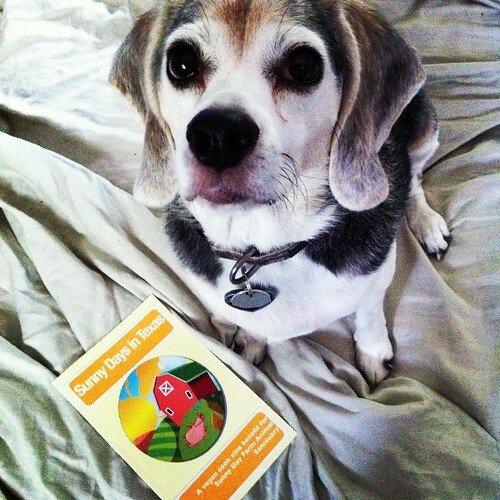 It is also illustrated with pictures of Sunny Day Farm’s most adorable residents and available in several different ways. My favorite is the full color print on demand version that also comes with a free digital download. For real, check out the preview on Mag Cloud.The sections are all color coded by type which makes it really fun to flip through and easy to find stuff and the animals are so cute you will be smooching the pages. Through the preview you can also see every recipe. A black and white version is available on Etsy, these might take a little bit longer to ship but they are pretty much the exact same thing but in black and white on regular paper and with a different cover and I have to put each one together so really buy the color one! Finally, if you don’t want to waste any trees feel free to email me at veganlazysmurf at gmail.com and for a 10 dollar paypal donation I will email you just the color PDF of the Mag Cloud version so you can look at it on your zune or whatever. Actually, please don’t ask me if it will work on your crazy device, it is a standard PDF file and I have an iphone so everything works like magic for me. 100 percent of the profits are going directly to the farm. If you would like to just help out without purchasing the zine please make a donation to Sunny Day on paypal to the email info@sunnydayfarms.com or sponsor an animal for a few dollars each month. Also check out the indomitable Molly’s Lonestar Plate post that includes other ways to help as well. And thanks Molly for all of your help (and the garlic stuffed olives). 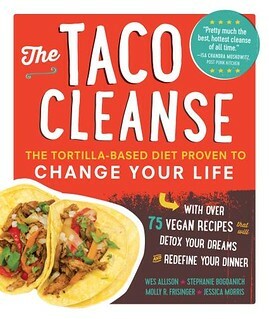 For veganmofoI am planning to cook recipes from the zine all month long so stay tuned to see what all is cookin’ ! 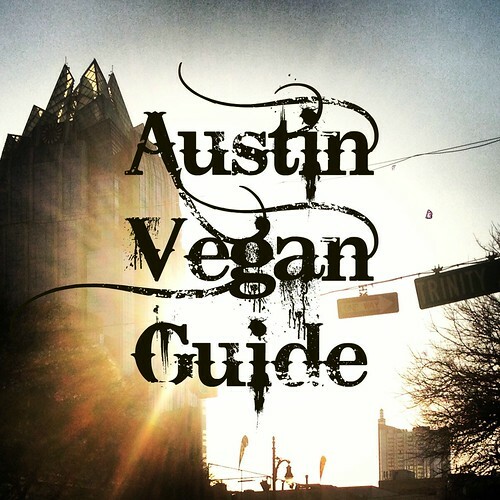 This entry was posted in Austin and tagged animal sanctuary, donation, Food, recipes, Texas, vegan, zine on October 3, 2011 by lazysmurf. I don’t know why the zine isn’t being sold at the Spiral (in FW – I haven’t checked the Dallas one). I may have just missed it (or maybe they sold out), but I wanted to buy it there. Unless I’m wrong, you might want to shoot them a email suggesting they put a few for sale on the counter. Sarah, that is a good idea, I’ll see what I can do. I live in Austin so I don’t get up to DFW very often. 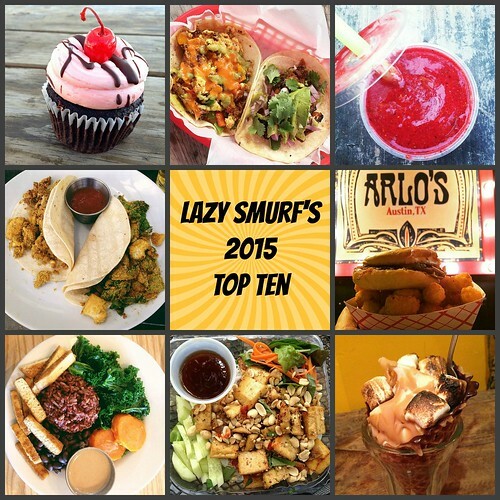 A bunch of people are going up in a few weeks for the Texas State Veggie Fair. I’m sure we can convince someone to take a stack up if Spiral is up for it. Awesome! I just wrote to see if they are interested in selling any! i got my copy a little while ago and i’m gearing up to cook dan and i some goodies from it! it looks awesome and i cannot wait! I can pick some up this weekend at my book signing and take them to both Spirals if they are interested!